The Helm Wind of Cumbria | Unofficial Britain. The Helm Wind of the North Pennines is England’s only named wind. 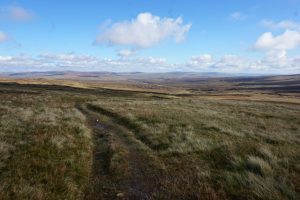 It is a true ‘local’ wind, being a product of the particular landscape and weather conditions found in the area around Cross Fell, the highest point along the 268-mile Pennine Way, standing at 893 metres above sea level. 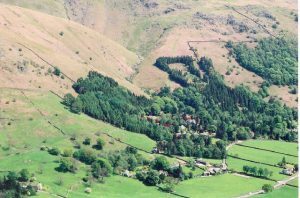 ‘A strong, cold, north-easterly wind that occasionally blows down the western slope of the Cross Fell range into the Vale of Eden in north-west England. 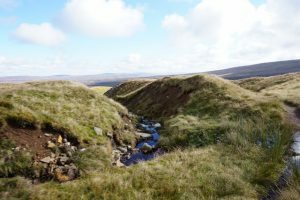 It occurs when the horizontal component of airflow is virtually perpendicular to the hills, which restricts directions to the north-east, and when a stable layer of air lies about 600 m above the summit of the range’. 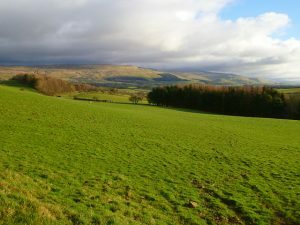 During an occurrence of the Helm Wind, a thick, heavy bank of cloud (the ‘Helm’ or ‘Helm Cloud’) rests along the Cross Fell Range, whilst, three or four miles from the foot of the Fell, a signature cigar-shaped, rolling cloud (the ‘Helm Bar’), forms and remains stationary over the mountain tops. The Helm probably takes its name from the Anglo-Saxon, signifying a helmet or head covering, and is a reference to this distinctive cloud formation. It is usually thought of as a ‘Foehn’ type wind, typically dry and acting down slope in the lee or downwind side of a mountain range. It has been likened to a “horizontal whirlwind”. Long before a scientific understanding of the atmosphere emerged, people were acutely aware of the impact of a multitude of wind-types on their daily lives and general well-being. The variety of names given to winds around the world reflects the importance attributed to them. Local names referencing direction or specific characteristics were used to refer to common winds, and were often associated with a sense of geographic orientation. The Ancient Greeks conceived of four winds; winds from the north (Boreas), winds from the south (Notos), from the east (Eurus) and from the west (Zephyrus). Today, many locally-acting winds have names. The effects and aftermath of a Helm wind were prevalent in the lives of the working people of Cumbria in past centuries. The wind not only helped to shape the landscape by scattering seeds, erode surface material, and in many instances govern the growth patterns and cycles of certain plants and crops, but conversely, as with any weather conditions with any degree of extremity, had the power to disrupt lives, shape behaviour, destroy structures. It became all-pervasive, and particularly during the times when meteorology was largely misunderstood or misrepresented, and superstition. Rumours of an impending Helm were met with fear and horror, and indeed some anecdotal references documented a number of fatalities, as well as severe injury and damage to buildings, livestock, local vegetation. Many of these tales, I have suggested, mutated and became ‘contaminated recollections’, or hyperbole, and as anecdotal ‘Helm lore’ proliferated, so perhaps did the magnitude of its mythology. ‘The corn stacks, the stone walls which divide the inclosures [sic], the roofs of the houses, the stunted trees that grow in exposed situation, in short everything that is exposed, bear marks of its impetuous force’. ‘I have known it strike like a chain-shot into a plantation of Scotch fir and larch, at Flakebridge, near Appleby, and for a space of about 150 yards in width, have seen nearly every tree torn up by the roots, and those trees which happened to have better hold of the ground, and refused at once to yield, had their tops snapped off, as if they were so many dried twigs or windlestraws’. When the Helm coincided with heavy snowfall, the drifts it created led to the loss of sheep and rendered transport across the fells difficult or impossible. 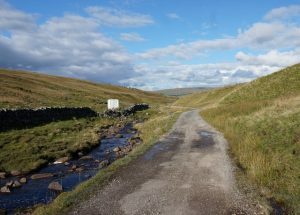 In 1844 the Morning Post reported, ‘The postman of the mail between Penrith and Alston was several times nearly blown out of his gig, and in the most bleak parts he was obliged to walk, holding on by the vehicle’. Published accounts of the Helm Wind appeared in historical and geographical guides across the counties of Cumberland and Westmorland from the late18th century. Joseph Nicolson and Richard Burn’s The History and Antiquities of the Counties of Westmorland and Cumberland (1777) included a description of the unique cloud formation that accompanied the Helm Wind, which it described as ‘a violent roaring hurricane… tumbling down the mountain’. 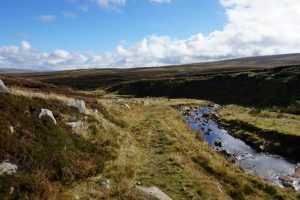 The authors referred to it as a ‘remarkable phenomenon’ rare in the county, though similar to winds experienced in ‘places bordering upon the mountains of Ingleborough, Pendle and Penigent’ in Yorkshire and Lancashire. ‘This helm, or cloud, exhibits an awful and solemn appearance, tinged with white by the sun’s rays that strike the upper parts, and spreads like a gloom below, over the inferior parts of the mountains, like the shadows of night’. The account then went on to reference the observations of a Mr Ritson, who had identified the wind as a function of the particular landscape formation at Cross Fell and likened it to winds at the Cape of Good Hope and the Straits of Gibraltar. In 2014, I published an art edition, Helm to draw attention to this phenomenon and revitalise interest in wind as an unseen component of the landscape and a phenomenon of location. I have noted and compiled 42 of the major and significant Helm reports in my little booklet, which took place between 1794 and 1935. It is a catalogue of disaster, which would not seem out of place with current reports of extreme weather. The notable differences being the relative powerlessness of agricultural labourers to come to terms with such disaster, due to the remoteness of some locations, combined with lack of technological and infrastructural support. Add to this the power and poesy of some of these reports, and the entire mythology of the Helm Wind, for me, became compelling. ‘It is accompanied by a loud noise, like the roaring of distant thunder: and is carefully avoided by travellers in that district [Cumberland], as being fraught with considerable danger’. These sonic anecdotes reverberate throughout the documented history of the wind, the sound of which might readily be compared to the infamously ominous incidental soundtrack to the movie, Jaws, which its director Steven Spielberg admitted was a more powerful manifestation of an unseen presence (in this case, a great white shark) than any physical or visual representation. And so it is with the Helm, the sound of which served both to warn and strike fear into those living and working under its presence. These archival public records and anecdotes not only convey the drama associated with more notable Helm events, but also point to the significance and value of the idiosyncrasies of place and local testimony in the formation of meteoric weather knowledge. In the post-Victorian era, key changes in meteorological science were about to be introduced that would challenge, though not entirely replace, this form of meteorological reportage. As stated previously, much anecdotal and circumstantial evidence was prone to contamination, exaggeration and lore, and as the science of meteorology developed in parallel to local amateur investigation, (notably through the empirical work, and rigorous investigation of the phenomenon by Professor Gordon Manley), the reportage and documentation became less dramatic. These changes to the institutional structure and practices of meteorology were evident in the way the Helm Wind was investigated in the latter half of the nineteenth century, although William Walton’s work had established an earlier precedent. Walton’s notes for his 1836 paper drew, to some extent on local Helm Wind folklore but equally stressed the importance of making regular, precise instrumental observations – he kept a meteorological journal at his home, in which he recorded temperature, air pressure, wind direction and rainfall, which he supplied to the Royal Society. Walton believed that it was only through such an approach that the cause of the wind would be discovered and demystified and ‘the superstitious notions which are still entertained among the vulgar in the neighbourhood respecting the frequent recurrence of so extraordinary a phenomenon’ repressed. This increasing institutionalisation of meteorology towards the end of the nineteenth century did not so much supersede or replace, but rather coexisted with a more popular, residential or experiential knowledge of, and interest in the Helm Wind. The increasing influence of these various institutions encouraged a shift away from individual speculation and judgement, discouraged the use of folk wisdom, and rejected weather prophesy. That said, there remained a commitment – particularly exemplified in the work of Manley – to promoting and understanding the relations that people formed with weather and place. Indeed, in as much as Manley was interested in the causative effects of the Helm, he was just as keen to draw upon local, anecdotal experiences of the Helm in order to incorporate its wider socio-cultural implications. This qualified inclusivity was extended to the value of historic accounts of weather events and climatic changes, even if the end of such study was an engagement with the physical rather than the human environment. In the words of Timothy Ingold, climate is recorded, weather, experienced. I cannot help but feel that what I have referred to as “contaminated recollections” have a rich, experiential folkish charm that located weather at the very forefront of people’s lives, which in these troubled climatic times we might all empathise with. Eijls is the author of a steadily growing body of works that recall “the lost, forgotten, abandoned and mythic” landscapes of Britain. His work encompasses experimental texts, photography and found fragments. Helm (20pp Booklet/CD) is available from: placefieldnotes.wordpress.com. Further examples of Eijls works can be found at his website or purchased directly from The Fireside Bookshop, Littlehampton. Hi Susie – Gareth here. I’ll pass your message onto the author of this piece. Many thanks!